We have recently designed multimedia material for the presentation of a completely new space-related project: TBT, a robotic telescope that will look for unidentified objects close to Earth. ESA (European Space Agency) is one of the biggest space agencies in the world, it’s an European intergovernmental organization dedicated to the exploration of the Solar System and the Universe beyond and to the launch and operation of different types of satellites. SSA (Space Situational Awareness) is ESA’s programme to guarantee our access to space by providing real-time accurate information about the space environment, specifically information regarding possible hazards to satellites and spacecrafts. This hazards may be, among others, harmful space weather, satellites colliding between them or a NEO impact with a satellite. NEOs (Near-Earth Objects) may refer to space debris and man-made satellites orbiting Earth or to Solar System small bodies such as comets, asteroids and meteoroids whose orbit crosses Earth’s orbit. In both cases they are potential hazards to our satellites that orbit Earth unprotected. Space debris refers to broken or no-longer-used artificial satellites; empty fuel tanks, jettisoned fairings and other wastes produced by rockets; small metal pieces resulting from satellites crashes; or any other waste produced by humans that is currently in an Earth orbit (usually LEO and GEO). The telescopes network in which the TBT project relies to detect and keep track on NEOs has, at the present time, two observatories at ESA’s ESTRACK DS1 and DS2 ground tracking stations. Isdefe was the prime contractor for this project, and it chose APM Telescopes to supply the telescope, mount and dome. DS2 (Deep Space Antenna 2) is an other ESTRACK tracking station located in Cebreros (Ávila, Spain) (Lat: +40º 27’ 09” Lon: -04º 22’ 03”). Here a second TBT telescope is located. During the day, the software will automatically create the STP (Short Term Plan), this is, each telescope’s observing plan for the following night. After sunset the RTS-2 based system will open open the dome unless the data from the weather station indicates otherwise. Then, the telescope should point itself to the coordinates set in the STP and while the mount is guided by the guiding camera the main camera will take pictures looking for NEOs. Those images must then be processed. The project is still relatively new but the first test have already provide promising results. In the test images above geostationary satellites (left), ExoMars (centre) and asteroids (right) detection was successful. The observations will continue until fully automatic operations phase is reached. 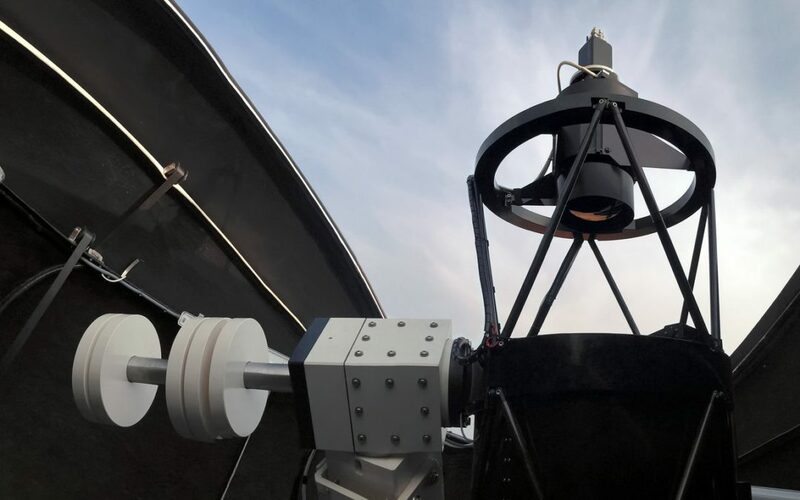 Moreover a new TBT telescope supported by ESO (European Southern Observatory) and located in Chile is foreseen, and more observatories will come in the near future. The long term objective of the TBT project is to build a big world robotic telescope network to automatically detect and keep track on every near-Earth object. Back to us, we have created a presentation video on this project along with other multimedia material such as 3D models of the telescopes. This materials are used to present and explain the TBT project in all kind of situations, for example it’s often used to present the project in possible future TBT telescopes locations or to explain to the younger ones the importance of keeping track on space debris.